She heads over to the shoe section (her first mistake) and faints to the floor over a pair of the perfect Guess pumps. As she recovers, her peripheral vision catches the perfect hue of emerald green. To her surprise, there is only one shirt left in her size....for 14$. She faints for the second time. A girl walks out of a TJMAxx......with everything BUT picture frames. Style Word: Changing up a top from day to evening is convenient especially if you are traveling. I usually wear jeans and flats during the day. To dress it up and convert over to an evening look, just add some heels and a richer lip color. :) How do you like to dress up a look? Leave your modern modeste post links in the comment section for me to check out! I like to dress up my look with a blazer and my favorite animal print pumps. I am wearing a very similar skirt on my blog post for today :) (I'd love for you to tell me your thoughts on it.) With this type of high-low skirt I like to dress it up with a fancier sweater and heels, and dress down with a t-shirt and sandals. Both looks are perfectly perfect! I absolutely love the color of that top. I've been on the hunt for an emerald green top myself. And I can't wait to see what color denim you went with! Perfect idea for day to night. Simple change, but adds the needed effect. How do you take such wonderful pictures? My husband and I are still learning. i love your outfit with the pants! it's so cute! Your nails are so freaking cute, Anna!! And I too have a problem with TJ Maxx. That scenario sounds exactly like something that would happen to me! I always add a pair of heels and darker/brighter lippy! Works a treat! Loving your mani in these shots! you are sooo pretty!! i LOVE the skirt and bag and shirt!! lovin that nail polish and high-low skirt! I'm in loooove with your skirt! Girl...love your day to evening and the new shoes! Also, your hubby takes some great pictures. love it, the first look is one of my faves so far! It's so true about T.J Maxx and I love your finds there! I haven't been since January. I think a trip there is due very soon. You're welcome! =) And you are looking fab. I dig the skirt. i kid you not. its TK out here. go figure. Oh Anna...you've done it again! :) And that pink pop of color is extraordinary! I'm curious to see your colored denim choice..I'm on the hunt too! These jewel tones always look so great on you! Stunning look from head to toe! I loove the color combo! The greenish with the pinky red necklace is so cute! I just went to TJ Maxx the other day and I couldn't believe all the cute stuff! Not gonna lie...I went crazy! Yes, that happens to me quite frequently too. Love your finds! Love your look! and that happens to me all the time with TJ maxx! 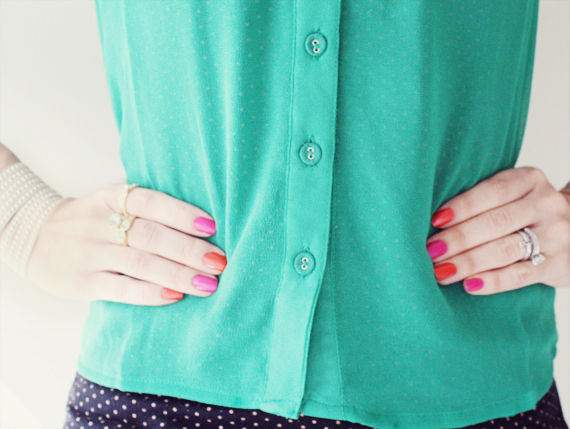 Love the skirt and your nails are adorable. Love this color combo. Your nails look so adorable. Great skirt, love the color and the asymmetric flow. LOVE the day look most of all, with the cute animal print flats! I'm not big on animal prints but that amount is just perfect (I almost wrote "purr-fect" but that would have been awful...ha ha). That's what happens to me at Target...I leave with everything but what I went in there for! I think you scored a great top though, I love that shade of green! Love it all, you look great. I can relate to your story completely. That skirt is gorgeous! Such a great find! Lovely outfit! I can see why you fainted over such a gorgeous shade of green top! I LOVE that skirt! I might have to go on a hunt to find one very similar! It's so flattering on you! You sure work it from day to night, girl!! I love your day to evening look! And your green shirt is so cute! pretty! just a nit-picky thing though, in prices the dollar sign comes before the number! sorry to be all teachery about it, but its a pet peeve! I do the SAME thing when I travel especially...same top- quick bottom and accessories change and you are GOOD TO GO! Adore that green color on you and I don't shop at TJMaxx for that reason exactly, lol. I always leave with things for my house and smelly oils that I never use, lol.
. love all the pictures. A seamless transition from day to night, I love it! Just beautiful!!! :) Thank you so much for stopping by my blog, yours is lovely! I love this outfit! you got that skirt at TJMAX? I may have to go there tonight! You look soooo pretty!! Love everything you're wearing, the colours are amazing together! Love how you made a few changes from day to make a stunning evening outfit. And your nails look awesome! That's me all the time! Shopping for unneeded things. :) But i love a good find. Adorable! I could have used this formula this past weekend in San Diego - the jeans and flats were worn out by nighttime! Love this idea, you look great! You're such a natural. love the outfit, the nails, everything- you are so gorgeous!! Phst - it was worth it! This is such a good trip for traveling and packing lighter! P.S.- Loving the orange and pink nail combo! -JB.